Snapshots into our life as we enjoy this journey together. Good evening! It has sure been a hot few days here in the south! I am so ready for fall. I walked into Hobby Lobby just the other day and my heart skipped a beat when I spotted pumpkins and even Christmas trees. I am so ready! When we first listed our house to sell, we did a major clean out of a lot of stuff. Most of it went to the playhouse because we really didn't plan on it taking 59853136years to sell our house. LOL. Not really but it feels like it. Darbee missed a lot of play time in there. A few weeks ago, we decided to have a huge yardsale. I made it a goal to clean out the playhouse completely so she could play again. What a job in the heat. Can you tell I do not like summer? I am a cold weather girl for sure! I was so proud to get it done and so was Darbee. Although it has been too hot to play out there much, it is ready and waiting for cooler weather. 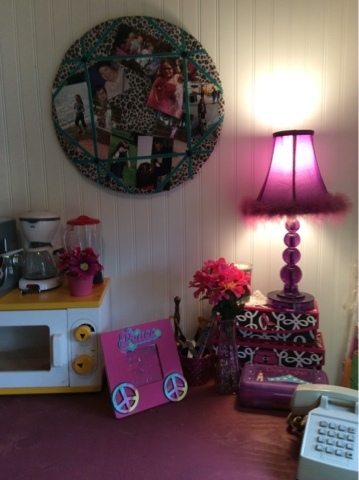 Darbee wanted you to come for a visit and see the new touches. 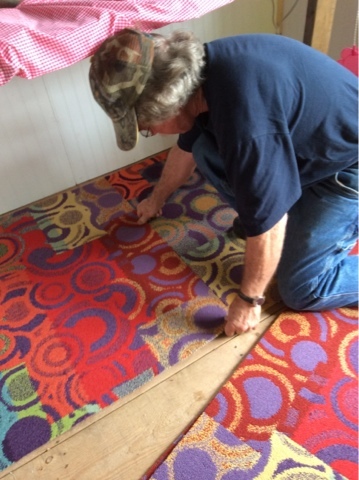 Papa was fortunate to get some very pretty carpet squares from his work. 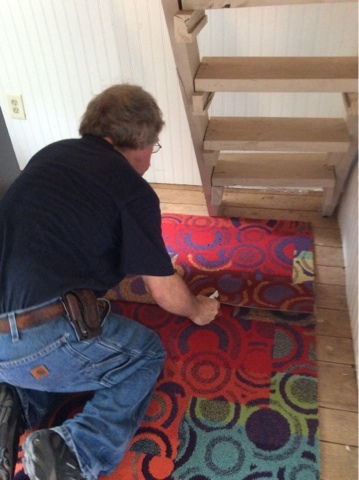 He came one evening and laid carpet in the whole playhouse upstairs and down. He had a little helper right by his side until she got hot. Hehe. She takes after me I guess. Here is the view as you walk in the front door. I just love the carpet. Darbee is excited she can now play without shoes! If you look to your right, you see the "kitchen" and desk area. She loves playing store and restaurant in here. I bet one day Papa will find a way for her to have running water....what ya think? 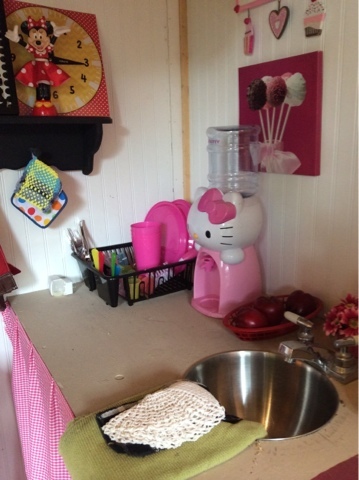 Here is a close up of the kitchen. And a close up of the desk. 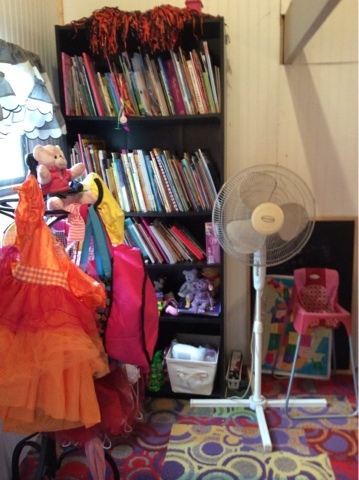 To the left of the door is the bookshelves and dress up clothes. 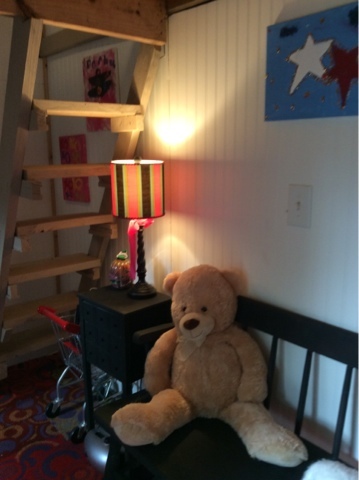 Upstairs is a cozy carpeted reading area and millions of stuffed animals. I just love this playhouse. What a fun area for her. Thank you Papa! 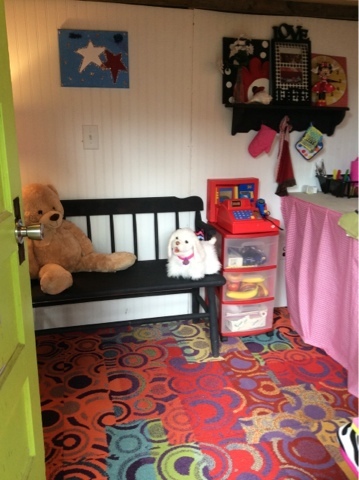 We hope you enjoyed your visit and will come play soon! Before I write anything else, I first have a huge praise report. In my last post I was asking you to help me pray for Darbee's tummy and that this diagnosis and the medication would be the answer. She took the strong antibiotics and thankfully had NO side effects! After nearly 7 years of hurting, I am so very happy to report that my girl has been pain free for over a week! Near the end of her medication, she could already tell a difference. She has also been able to return to her normal diet and is eating pretty much anything she wants. She has had gluten, dairy and things with eggs in them with no problems whatsoever. I give the credit to Jesus for healing my girl. Thank you Lord for giving this doctor the knowledge to think to test for this bacteria and knowing what to do. Thank you for praying for her too. 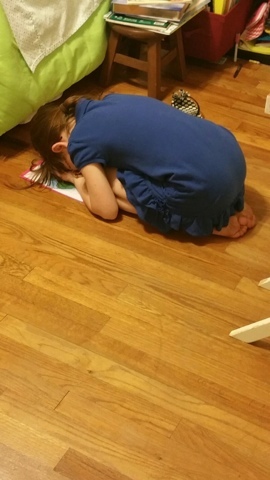 You know, she went to VBS a few weeks ago and they made prayer pads. She brought hers home and put it beside her bed. She was so excited. That night, she got really quiet and I couldn't find her. When I finally found her, this is what she was doing. I just stood at her door and soaked up the moment. Oh how I hope and pray that this girls always has a desire for Jesus in her life. 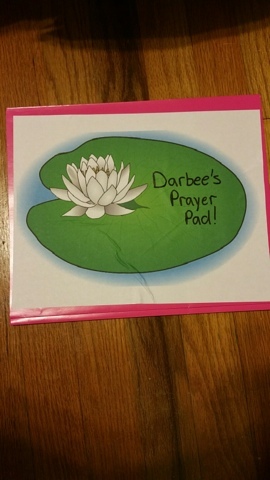 So this prayer pad started something. She and I now pray together at this prayer pad or mine (she made me one too) every night. We pray out loud together. We talk about our prayer requests and I pray first and then she prays. I can't tell you what this time together means to me. It has done my heart so good and oh how I love talking about Jesus with her. I have prayed and prayed so hard with her for healing of her tummy. For her not to hurt. She has heard my prayers and knows I wanted her to feel good more than anything. Jesus hard those prayers and has helped my girl feel better and I will be forever grateful. Now every night during our prayer time, I thank him for what he has done. We were riding in the car a few days ago and she told me she felt like a brand new person. She said she had had days before when she felt better but she had never felt like this. This makes my heart so happy. Good evening. It sure is hot here in the south! It was in the mid 90's today. I enjoy fall and winter so much more. I am not made for the heat. Yuck! This may be a long post, but I wanted to fill you in on what has been going on in our world for quite some time. When Darbee was born, she had reflux issues in the hospital. We switched formulas twice before we brought her home. She has had stomach problems most of her life. It has always been treated for reflux. She has taken her fair share of Zantac. Nothing seemed to really help. She always just tolerated it and we learned what bothered her most and avoided those foods. The last year and a half or so we have seen things get worse. She was having more stomach pain and some pain led to vomiting.Her stomach pain never went away. You could ask her any time during the day or night if she was hurting and she would say yes. It was worse at night, but always there. One day, she said to me, "Mommy, I think Jesus just made me to hurt. It's ok and doesn't hurt that bad. That is just how I am made." How heartbroken I felt as her Mommy not to be able to do something that would make it go away. I resolved that day and made a promise to myself to find out what the cause was. I would not stop until we found a cause other than "it's just reflux." Why keep treating her for reflux if it wasn't helping? 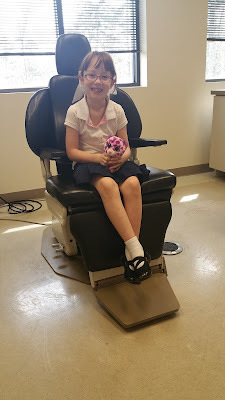 Another trip to the doctor and her pediatrician said maybe it was from all of the infection from her tonsils. 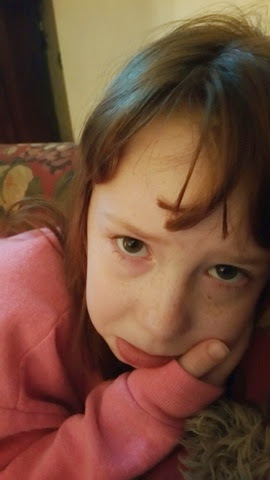 She assured us the pain would go away when her tonsils were taken out and the infection was cleared. I was so excited and hopeful. So was Darbee. Honestly, it has gotten worse since her surgery. We were all so disappointed and discouraged. 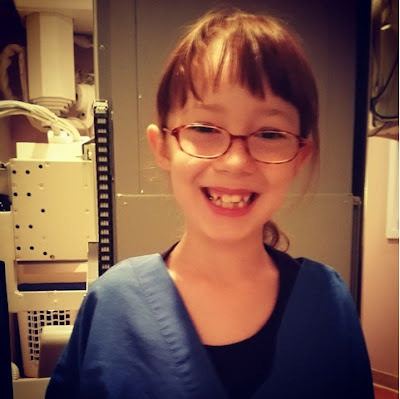 After abdominal x-rays and an abdominal ultrasound, her pediatrician said she couldn't do anything else and was going to refer her to a GI doctor for them to scope her. We were left with no answers. This has been going on for most of her life and we just want her to not hurt and feel normal all the time. I have talked to so many moms and read so many internet articles searching for an answer. A friend of mine mentioned us seeing her daughter's doctor who had helped her with some stomach troubles. I was ready to try anything so we switched pediatricians. I was so impressed with this new doctor. He seemed so very thorough and very attentive. He didn't want to just prescribe her a medicine for something, he too seemed to want to find the root of the problem. He did another ultrasound and many many blood tests. The only thing he found was some food sensitivities. Maybe this was the answer. Darbee started a new diet in March. She was to eat nothing that contained gluten, dairy or eggs. Basically nothing. She has been the best sport about it all. Me....not so much. It is hard! We have found lots that she can have but not much when you really think about it. I have found vegan sour cream and onion chips, vegan chocolate chip cookies, and even tried to make homemade biscuits without grease, milk, or eggs. Yuck! Can she really do this the rest of her life? Two weeks ago, we went for a follow up on the diet. It has helped a lot, but the pain is still there. The vomiting is still randomly happening. We are still having to get up at night with a tummy ache. At this visit, we just happened to see the nurse practitioner. Honestly, it was God that did it. He knew who we needed to see. She was amazing! She asked if she could draw blood just one more time and check for a bacterial infection. She said it was not likely she had it but she just wanted to rule out one more thing. She also ordered an upper GI. Darbee has had so much blood work done in the last year, she cringes when they mention a needle, but she made it. The upper GI went well. She was so brave and swallowed all of that yucky stuff like a champ. I was so proud of her. I don't think I could have got it all down. Last week, the nurse called and asked us to make an appointment to come in and discuss the blood work. There was some issues. My heart raced a bit but I was just hopefull for an answer. Yesterday was that appointment. I didn't want or really expect anything bad but I was hoping for an answer. Her upper GI test was perfect. No problems there, thank the Lord. Guess what? She tested positive for the bacterial infection H. Pylori. This could be our answer we have been waiting years for! This is a bacteria that burrows in your stomach and attacks the lining of it. It also lives in the small intestines and can cause terrible problems. It can even live in your mouth and cause tooth problems! It can live in your body for years. I am so hopeful now that maybe we FINALLY may have an answer. H. Pylori is treated with a triple therapy approach. 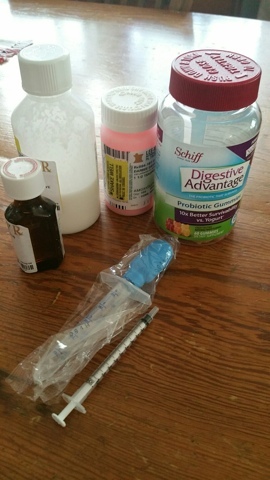 She has been prescribed two super super strong antibiotcs that she takes together two times a day along with a stomach medicine and a probiotic. Whew! It may be a rough 10 days but they are confident this will destroy the bacteria and she will feel a difference. Will you help me pray this is the answer? That this will be the end of a super long journey. That she will not have a nagging stomach pain all the time anymore. That she will not have to have a scope done. That we will be able to go to bed each night without having to get up and sit for several hours until the hurt goes away. I am praying so hard this is it. Stacy and I will also be tested. It is not sure how this bacteria is transmitted but likely that since she has it, one or both of us do as well so we will both be tested. This way we will ensure she will not be reinfected from one of us. We are hopeful and so thankful for these new doctors who have come into our lives. And you wanna know the best part? Once the next two weeks of medicine taking is all over, she is allowed to slowly start reintroducing normal foods again!!! She cannot wait! 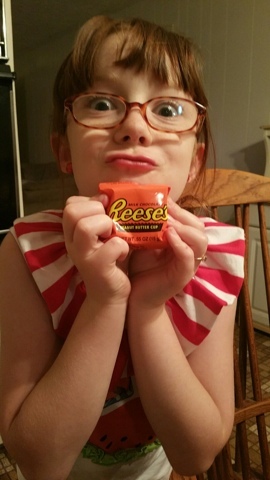 We did sneak in a treat last night to celebrate. It has been forever since we have visited with each other. School is out and a lot of changes are in store for us this next school year. I will share those with you in another post. I am excited to get back to blogging. It has been a nice break but I have missed everyone and missed catching up with all of you. I am looking forward to blogging again and keeping you up to date with what we are doing. 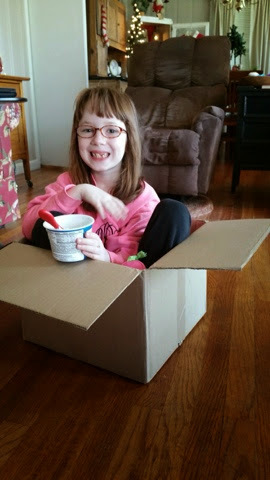 When we last visited, Darbee had just had her tonsils out. She healed nicely and has not had any problems since. We are so thankful that is all over with and there will be no more trips to the ENT. She was given the all clear! 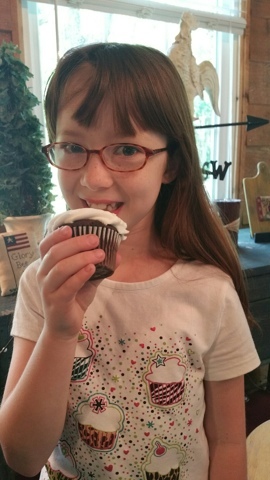 She finished first grade and we have been enjoying our break. School was out for us mid May so we are well in to our summer. We are enjoying lots of doing nothing and quite a few play dates. Darbee made lots of new friends this school year so we have quite a few friends to keep in touch with during the summer. She is enjoying seeing her friends and I am enjoying chatting with the moms. The weather hasn't been too hot yet, so we have enjoyed a lot of outside time too! Papa made a tree swing for Darbee and it is her favorite! I will be back soon and update more. Just wanted to hop on and say hi and let you know I am still around. It's been a long time....here's what we've been up to! Good evening! It has been a long time since we last visited. We have had a lot going on here at our house. First of all, we had a great Christmas. We were all happy and healthy and that was enough. Darbee got some neat toys and we had a ball playing with everything. 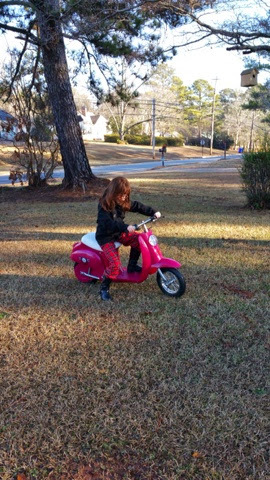 Her favorite was a Polaroid camera and an electric ride on scooter. That thing will fly! 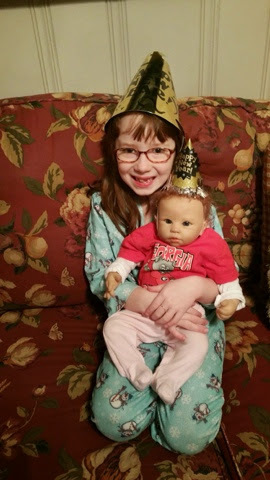 On Dec. 29th, Darbee had surgery to remove her tonsils. After six cases of strep since August, it was what needed to happen. Poor thing has been on an antibiotic for months. The surgery went well but the recovery was rough! Most days were a lot of this. I felt so bad and so helpless. Getting her to drink was nearly impossible. I was so happy when she finally ate a little and felt like playing some. Thankfully now she is back to her happy playful self. 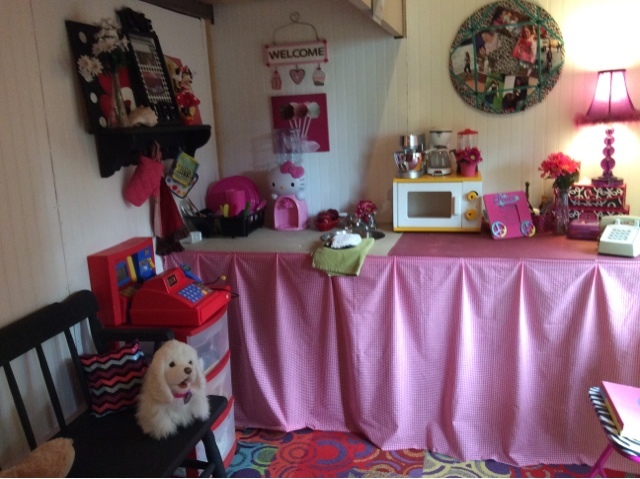 Darbee's American Heritage Girls troop had a mother/daughter banquet a few weekends ago. It was a lot of fun! 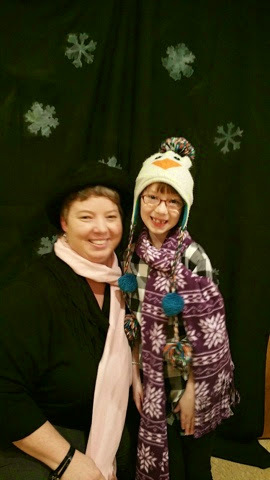 They had a silly winter dress up booth...we had fun at that! Good Mommy news! I got hired at Darbee's school! I am working as a teacher's assistant 1/2 a day for now on the two days she attends school. I love it! I just love her school and am so happy to be a part of it. 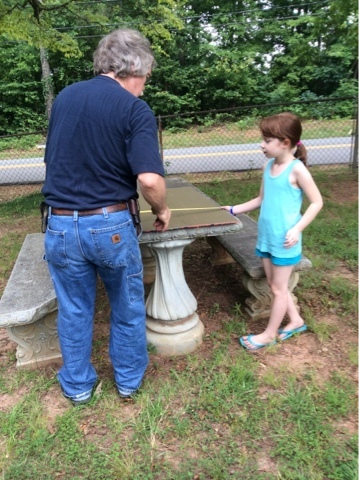 Last week, I helped out in the first and second grade science class. 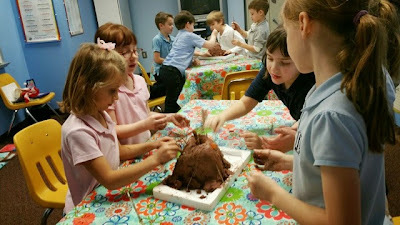 They are studying volcanoes and were building ones out of clay to explode. This past weekend, Darbee, Nana and I took a girls trip to Pigeon Forge. We had such a good time. 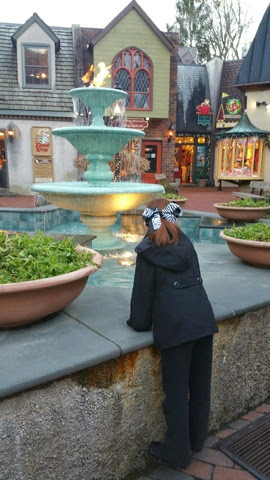 We shopped in Gatlinburg and Pigeon Forge. 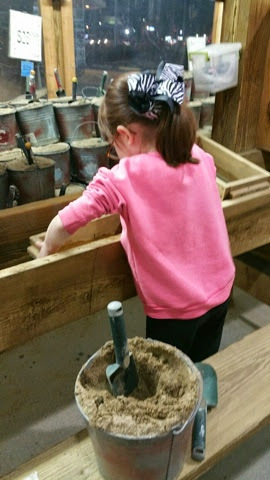 Darbee has a rock project due at school in a few weeks, so we mined for gems to get some neat rocks. That was a lot of fun and she is ready for her project! 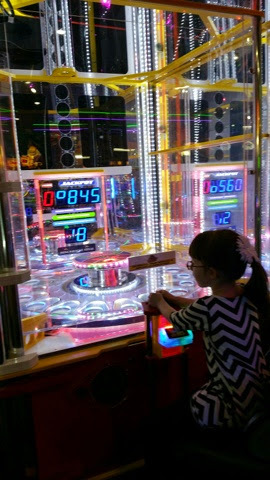 We had fun at the arcade too! I love these getaways with just us girls. Such fun tomes and great memories! We are back in the groove of school after Christmas break and surgery. We are learning about pronouns, the Turks and Constantinople, ten frames and ordinal numbers in math and volcanoes in science. So much fun! I enjoyed visiting with you again! Good evening! I hope you all are having a fun weekend. Are you ready for Christmas? I am not finished with my shopping. Still a few treasures left to buy. We have had a fun weekend here. 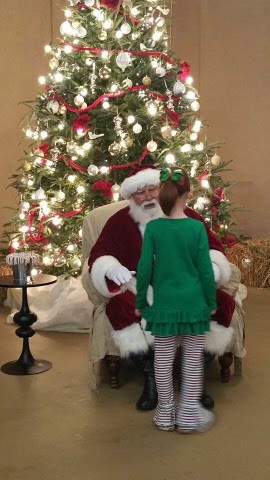 Our elf, Jingle Bella has been visiting each day and luckily so far she hasn't made a big mess. 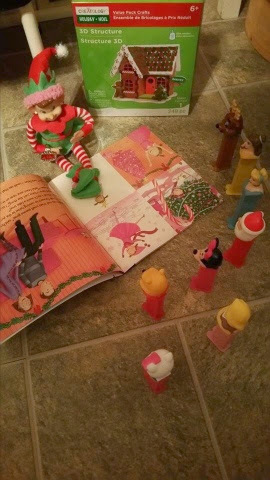 She was found one morning reading a new Pinkalicious Christmas book to some friends. She brought her a neat foam gingerbread house to put together and decorate. 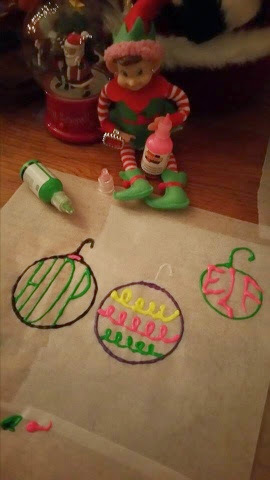 Another morning, she decided to make her own puffy paint ornament. These did not work by the way. They would not pull off of the wax paper. I had someone suggest doing them on clear file folders. She said they peeled easily off of those. We will try them again. 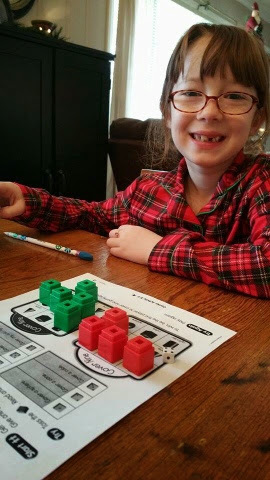 We made our math lesson festive on Friday using red and green cubes for our game. We just have two more weeks of school and we are out for Christmas break. I can't wait! 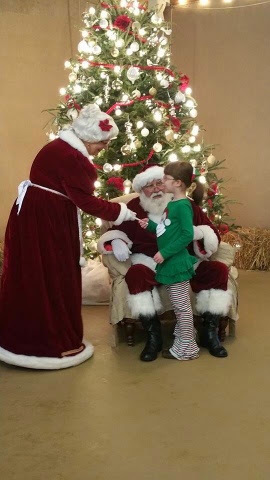 My husband's work hosts a breakfast with Santa each year. Darbee always looks forward to it. It is catered by Chic-fil-a and lots of fun. 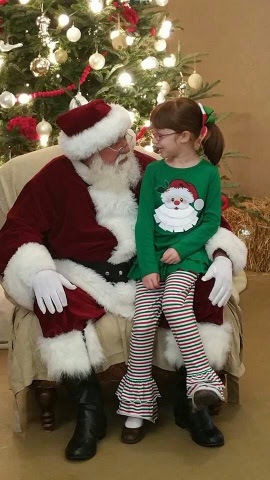 She had fun making Christmas crafts and talking to Santa. 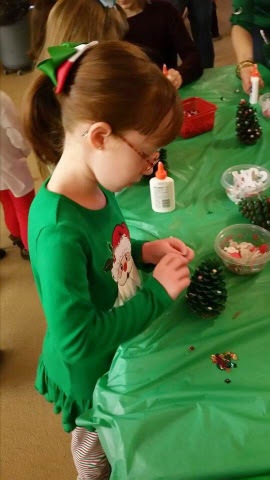 She made a pinecone Christmas tree. 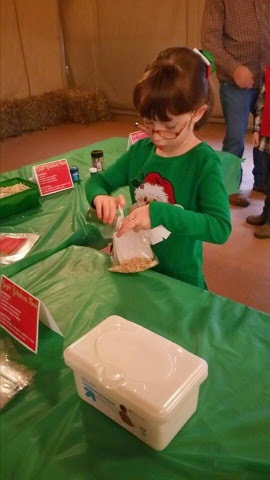 She also made reindeer food for Christmas Eve night. 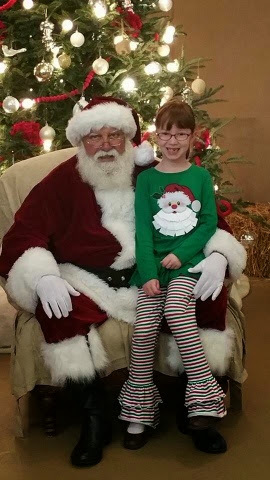 I am sure those reindeer will love all of the glitter she put in. Hehe. 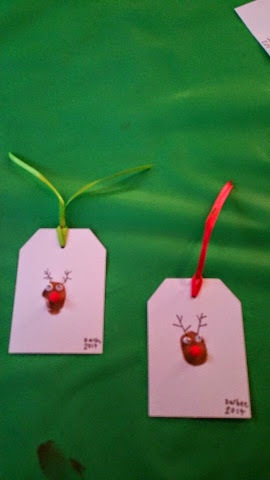 I really like these gift tags she made. I think we are going to make more of these at home to put on our presents. What a cute idea and super easy! Santa was great. The tree is always beautiful! Even Ms. Clause took time off from her work to come and visit. We enjoyed a fun afternoon shopping with Nana afterward and went to a Christmas play in the evening. Whew! Such a fun time of the year! What is your facorite activity you have done so far this holiday season? Take time to make a special memory. Congratulations Cindi! You are the winner. Please e-mail me your info and I will get a little something in the mail to you. 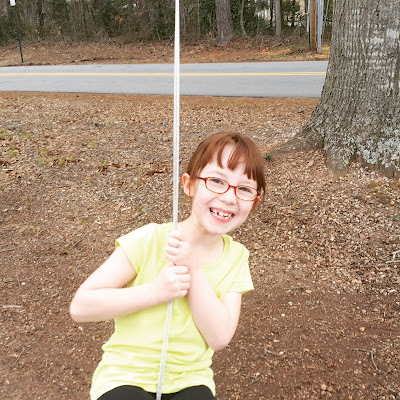 We are a Christian homeschooling family who enjoys spending time learning together.